Wednesday Toys is a small new independent Australian online toy store by Jarrod Penfold, with the aim of helping to fund his toy design aspirations. Jarrod fell in love with toys growing up in the 80s, and still has many of his originals. Among his favourites are the classic Transformers, He-Man, G.I. Joe, Star Wars, Machine Men, Voltron, Teenage Mutant Ninja Turtles, Centurions, Sky Commanders, Zoids, Robo Force, Starriors, and Lego. He has collected toys for over 30 years. Here at Wednesday Toys we especially love toy robots - the meaner and more capable-of-destruction-looking, the better! Our attention is slowly turning to DIY toys and customisations; toys that allow their owners to express their creativity. Wednesday Toys aims to share our toy passion with Australians by selling awesome toys at reasonable prices, and our focus is shifting more and more to toy design, 3D modeling, and 3D printing. If you have any questions or comments, please feel free to contact us at info@wednesdaytoys.com! Otherwise you can check out our Facebook page. 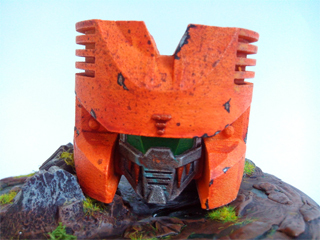 The severed Proterus head of Tigris Redemptor, 'the Jungle Demon' (original design).